Dimensions 1 by 9.40 by 6.50 in. Amazon.com description: Product Description: When people are facing difficulties, they often feel the need for a confidant-a person to vent to or a sympathetic ear with whom to talk things through. How do they decide on whom to rely? In theory, the answer seems obvious: if the matter is personal, they will turn to a spouse, a family member, or someone close. In practice, what people actually do often belies these expectations. In Someone To Talk To, Mario Luis Small follows a group of graduate students as they cope with stress, overwork, self-doubt, failure, relationships, children, health care, and poverty. He unravels how they decide whom to turn to for support. And he then confirms his findings based on representative national data on adult Americans. Small shows that rather than consistently relying on their "strong ties," Americans often take pains to avoid close friends and family, as these relationships are both complex and fraught with expectations. In contrast, they often confide in "weak ties," as the need for understanding or empathy trumps their fear of misplaced trust. In fact, people may find themselves confiding in acquaintances and even strangers unexpectedly, without having reflected on the consequences. Someone To Talk To reveals the often counter-intuitive nature of social support, helping us understand when people will keep depression secret from their close ones, why people may avoid reporting sexual assault, how people may decide whom to come out to, and why even competitors can be among a person's best confidants. 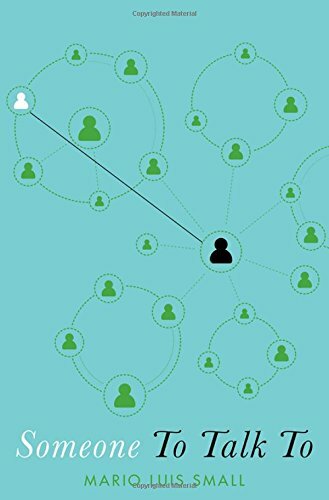 Amid a growing wave of big data and large-scale network analysis, Small returns to the basic questions of whom we connect with, how, and why, upending decades of conventional wisdom on how we should think about and analyze social networks.